Simply put, if we want to be here tomorrow, we need to think like tomorrow. As the pace of industry change continues to increase, rapidly, it is becoming more important that businesses are quick in adopting new technologies, reinventing old ones and innovating adaptable communication solutions early on to stay ahead in this competitive time. Now all that sounds great,butyou’re probably asking how exactly we intend to stay ahead. First, it would be useful to understand what the need of an agency has become. Understanding the client’s business goals and processes, identifying challenges and opportunities, then designing a binary-native communications methodology and strategy is the core of what C2 Native is developing.NLP, machine learning, AI, predictive analytics, AR, VR, and many other terms and technologies are frequently popping up in our day-to-day conversations with clients and partners. But are we in a position to understand what they are all capable of? Are we taking ownership of these tools, testing, analyzing and adapting as we go? And, most importantly, how are these serving more efficient communication? Today it may be enough to merely understand these emerging trends(if you don’t, then good luck to you); but as tomorrow emerges, it is just as important to be able to connect all the technology dots in order to create successful business solutions. At C2 Native, we are on a mission to modernize marketing by adopting digital transformation and striving to constantly innovate business solutions. We have our very own communications lab, capable of testing the potential strength of a brand’s ideas for business in the future, which we look at through a practical, not just future-theory lens. By defining the customer journey touch points and orchestrating AI, modern social media, future technologies, big data advertising, and marketing automation, we can help our partners automate the whole marketing funnel; working towards a more efficient communication model, based on centralised controlled and adaptive audiences (welcome to the segment of one), targeting zero media wastage and an incremental business growth. Speaking of which, have you met Ainia, our full-time AI robot team member? Now don’t expect a cup of tea, but the one-year-old fellow is now even stepping out of our lab to serve other businesses. Yes, the robots, they are here. We have employed one and appointed a few with various clients to help with work efficiency. On a daily basis, we aspire to communicate, not advertise. We communicate as a business process and vehicle for growth. 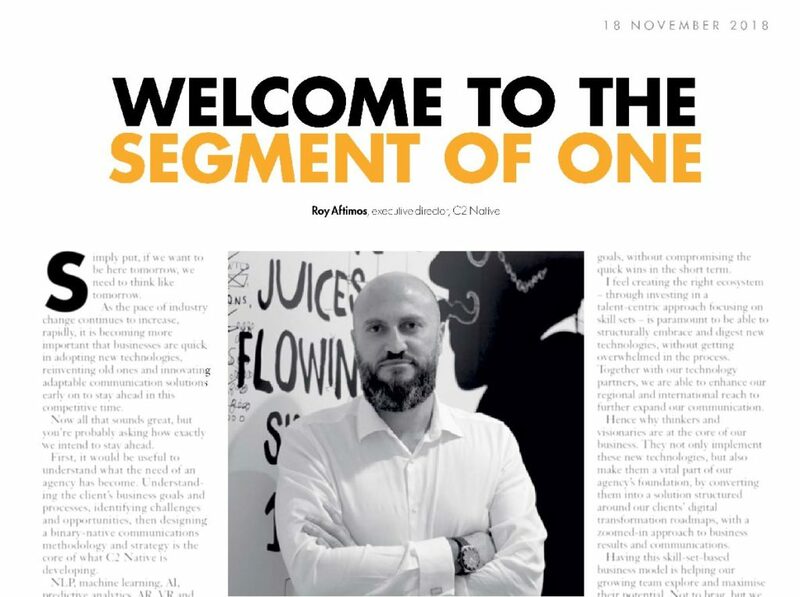 When I walk into the lab I can immediately see the guys echoing the thoughts of our chief innovation officer, CumaiAboul Housn: “We always start with a white canvas, rather than a pre-set menu of solutions. Every business has its own unique challenges and goals; we use these as the base to define a relevant approach and methodology. For us, technology is not the goal or the purpose. What differentiates the master chefs are neither the ingredients nor the tools they use; it is being able to create the perfect recipe.”To this end, we do not limit our thinking to today’s possibilities; most of today’s technologies are becoming obsolete within the lifecycle of a mid-term project. Our communication strategy must be sustainable and directly linked to long-term business objectives and goals, without compromising the quick wins in the short term. I feel creating the right ecosystem– through investing in a talent-centric approach focusing on skill sets –is paramount to be able to structurally embrace and digest new technologies, without getting overwhelmed in the process. Together with our technology partners, we are able to enhance our regional and international reach to further expand our communication. Hence why thinkers and visionaries are at the core of our business. They not only implement these new technologies but also make them a vital part of our agency’s foundation, by converting the mintoa solution structured around our clients’ digital-transformation roadmaps, with a zoomed-in approach to business results and communications. Having this skill-set-based business model is helping our growing team explore and maximize their potential. Not to brag, but we are currently equipped with more than 300different skills. This means we are able to increase flexibility and ability to handle projects of a different scale. With such a diverse set of skills, the team is able to answer a multitude of digital business challenges, while not losing its creative communication edge. Right now the team is participating in the Dubai FutureAccelerators, as part of the DubaiFuture Foundation. who will provide an ecosystem involving the parents, the child, and schools, that will help improve the relationship between all education stakeholders. Again, in the era of change, being agile, flexible and simple is the recipe for growth and success. The C2Native team is on a continuous mission of exploration, never limited to today’s methods, tools or technologies but always maintaining our DNA as creative communicators.